All about math department projects and events. This just in from Mr. Matthias! The Mathematics Department’s Engineering & Robotics I course introduces students to the fundamentals of the engineering process, robots and robotics sensors, and the computer programming skills required to make robots interact with the world. This trimester’s students have learned how to make their robots move in a straight line for a specific distance and how to make their robots execute swing and point turns for a specific number of degrees. With these foundational skills under their belts, it is time for the students to show-off their knowledge and have their skills assessed! In Engineering and Robotics I, major assessments rarely use traditional testing methods. 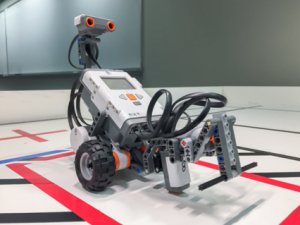 Tests are called “Challenges” and present a three-dimensional environment in which the students’ robots must successfully negotiate a “test course” on the classroom’s Challenge Table. Challenges are scored based on how accurately the students’ robots accomplish their task on the Challenge Table and by the quality of the students’ computer programs. Students are now working on the “Labyrinth Challenge” as their first major assessment. 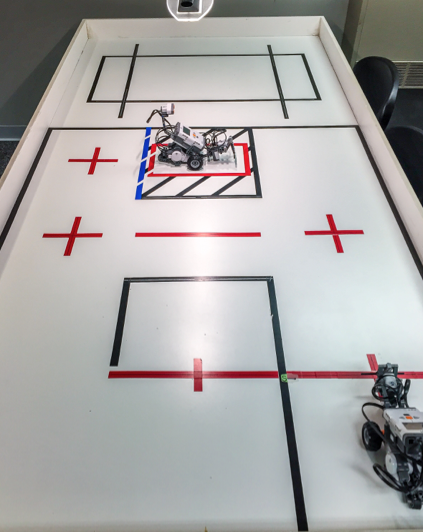 The Challenge’s goal is to have the robot move from the red start line (on the lower right) into the black and red goal box (upper center). Along the way, the robot must travel to each of the three red crosses. To achieve this goal requires the students’ robots to combine a series of highly accurate, straight-ahead movements with precise 90-degree point turns executed on each of the red crosses. The following video shows the students practicing on the Challenge Table as they develop the computer programs. The Williston Northampton School’s Mathematics Department’s mission is to develop competence, confidence, and perseverance in our students, allowing them to realize the relevance and importance of an exceptional mathematical education both for its beauty and for its practical application. Meet the Math Students of the Trimester! Professor Po-Shen Loh @ Williston! Josh Seamon on 2018 AP Calculus BC Free Response Questions & Answers! Jessica Stillman on 2018 AP Calculus BC Free Response Questions & Answers! Josh Seamon on 2016 AP Calculus BC Free Response Questions & Answers! Liza on 2016 AP Calculus BC Free Response Questions & Answers!